During the afternoon and evening of Thursday, 11-October, Tropical Storm Michael strafed our area with the expected rain and wind. Around 1400 we lost power to the marina, but only for about 30 minutes. But later, between 1900 and 2000 hours, as the low pressure center made its closest approach, we saw winds clocking a steady state around 50 knots with gusts to 60+ knots, and that was more than enough to knock out utility power for an extended period. 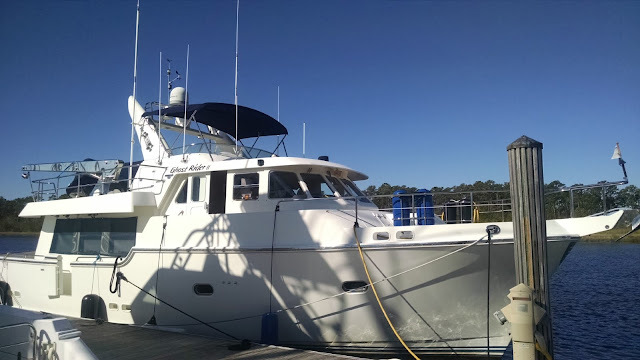 So we cranked up the generator and became self-sufficient, a lot like being at anchor, but with the protection of the River Dunes harbor area. Nonetheless we saw whitecaps and 2 foot waves in the marina. We were securely tied and adequately fendered, so had no real concerns….with the winds cranking mostly out of the south as Michael passed just to our west, as long as no other boats broke free from the other t-heads then we would remain safe and secure. We had the typical tornado watches that always go along with the tropical systems but no twisters materialized in our area. The increasing winds did make for some interesting acoustics – there was the usual howl, especially during the gusts, but some odd harmonics set up as the strong southerly blasts sang through the boat’s rigging and gear overhead. We got used to it. As far as we could tell everything stayed where it should be, but we didn’t bother to venture outside to verify. That could wait until morning. The good news was the thing was moving like a freight train and around 2100 the rain bands had cleared out and winds dropped to a steady state in the 20’s with gusts to the mid-30’s. 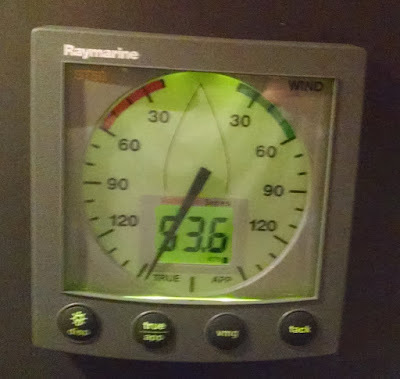 Around 2300 the marina power came back online so we were able to power down the genset and reconnect to shore power at that point, with winds down to a steady state of 10 knots with gusts to around 20. So the worst was definitely past, and even at its peak strength the conditions here were nothing compared to the devastating winds and water that the Florida panhandle area just experienced. The local meteorological conditions continued to moderate throughout the night, and by the morning of Friday, 12-October the remnants of Hurricane Michael had accelerated far to the northeast, clobbering Norfolk and the southern Chesapeake in the process, but leaving a relatively calm and sunny day for us in its wake. The cold front that had chased the tropical system off on its northeast vector also brought us much cooler temperatures and lower humidity. A walk around and over Ghost Rider revealed no damage or missing components, and we spent an hour or so restoring the boat to its normal ready-to-cruise profile. According to the River Dunes dockmaster only one boat had any damage, and that was because they were foolish enough to leave their Bimini canvas top up. We did not get cell phone and Internet service back until mid-afternoon, and at that point you couldn’t tell a hefty storm had just barreled through here. The rest of our day will be spent making final departure preps and a shopping / provisioning run into town. We’ll depart here in the morning and make an overnight run on the outside down to Charleston.